The Taurus Team experience in working with start-ups and entrepreneurs, combined with our well-honed event management skills, enabled us to move quickly when we won the engagement to co-ordinate a major pitching event in Sydney. 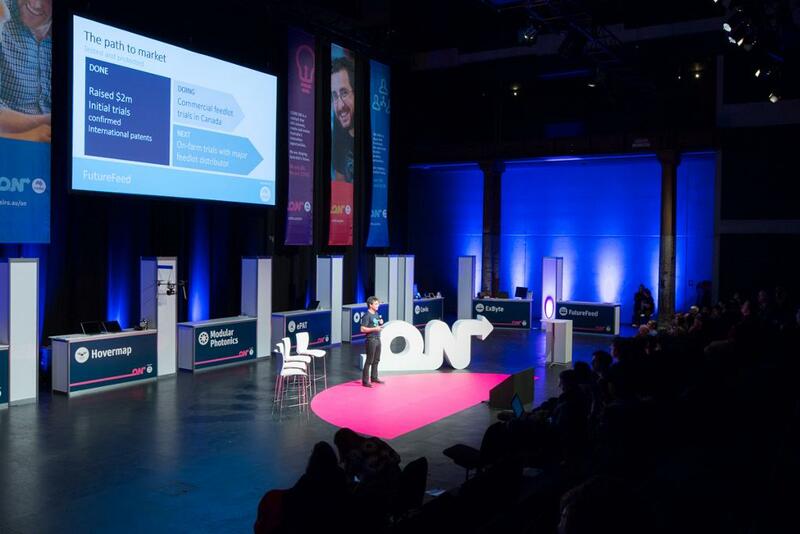 The challenge for Taurus was to organise and manage the CSIRO’s “Demo Night” where participants from its ON Innovation program would showcase their science and technology innovations in a public forum. They would pitch their ideas to an audience of 350-400 investors, potential industry collaborators, start-up representatives, entrepreneurs and their scientifi c and research peers, from across the national research landscape. It was also an opportunity for CSIRO to demonstrate the impact of the ON Innovation program on developing skills and fast-tracking valuable technology. On the night, the event was scheduled to have two keynote speakers while 11 teams would pitch for two to three minutes. Afterwards, each team would have a dedicated stand where they could showcase themselves and their ideas. Through our networking in the start-up ecosystem, Taurus was well known to senior executives at CSIRO. A year earlier, Taurus played a pivotal role in achieving major publicity for the fourth Global Australian Awards of the year. Advance is the largest global network of high achieving Australians and alumni of Australian universities worldwide. Moreover, the Chief Executive Offi cer of Taurus, Sharon Williams, was a former chair at the CEO Institute. Sharon works with CEOs and MDs, partnering with them to introduce smart and practical Marketing and PR concepts to achieve business objectives. Through those connections, the CEO of the CSIRO, Dr Larry Marshall was quick to support the appointment of Taurus as co-ordinators of the Demo Night. Despite having less than a month to pull the event together, the Taurus team responded eff ectively and quickly to producing an event that met both the client’s budget and branding needs. While using their own professional contacts, members of the Taurus team spoke regularly with the client’s marketing department to ensure that all resourcing decisions met with approval This included setting budgets and negotiating the best prices with suppliers. Taurus co-ordinated the staging of the event, which included identifying the best location, organising the event crew and equipment, arranging lighting, AV, ticketing and catering, and at all times, considering the client’s preferred list of suppliers. Taurus arranged for two keynote speakers and an MC to kick off the pitches that were held at Carriageworks in Sydney’s Inner West. Utilising Bay 17 that can cater for about 1000 people, Taurus arranged to split the space using black curtains which provided theatre style seating at one end of the room for 400 people. Taurus also oversaw rehearsals ahead of the pitching event. Additionally 11 booths were provided for each team similar to a convention/exhibition space where team members could speak with interested audience members. Each team’s space was clearly identified and easily located. Taurus followed through keeping an eye on the detail involved in co-ordinating the event. We co-ordinated all branding material, right down to including a goodie bag for each attendee.